Or: this book should win the Best Novel Hugo. Or: I bought this book twice and I don’t even care. Or: I wish I could go back in time and read this book again for the first time. I first heard about this book due to Scott Lynch’s blog, where he raved about it. Since then, it has reached critical fan mass in my circle of writerly friends, and I finally decided that I needed to get in on the lovefest. I was not even a little disappointed. It is entirely composed of intense conversations in small rooms with subtle body language — and that is the beauty of it. I’ve heard negative reviews that complain that nothing really happens and… well, it’s kind of true. Don’t expect a three-act structure, or cliffhangers, or action that flies off the page. The first half of the book is nearly an hour-by-hour recounting of Maia’s (the title character’s) first days as Emperor of the Elflands. Who is his steward? What will he do with his hated guardian? Who will his bodyguards be? What the heck is the Lord Chancellor up to? What will he have for luncheon? If this sounds boring to you… well, it’s possible this book might not be your cup of tea, but let me explain why it worked for me. Monette manages to makes the stakes clear for even the most trivial decision. If Maia doesn’t choose correctly, he might offend somebody, or lose an alliance, and that could have dire consequences for his future as an emperor, or his lifespan. For example, one of the issues Maia must decide in his first days on the throne is the issue of his half-sister’s marriage. It would be advantageous to make a political alliance, but she would rather “study the stars.” In navigating this, Maia has to choose between forging relationships with his family members vs. making alliances with outsiders. It’s also a struggle between what he feels is right — that his half-sister should do what she wants with her life — and what is politically necessary. The results of this seemingly boring decision end up having life-threatening consequences for Maia by the end of the book. Okay, let’s be more general and say, “the anti-grimdark.” But I have GoT specifically in mind because a friend who is a GRRM fan asked me if she would like this. I wasn’t sure what to tell her. It has some things in common — political intrigue, primarily — but its outlook is much less pessimistic than GRRM’s. A policy impasse which might be solved by murder and poison is solved by a tipsy dinner conversation instead. One of the members of the privy council steps forward to offer to educate Maia on the political currents, and has no ulterior motive. Mostly, Maia succeeds in his role by being a genuinely good, earnest person, and I felt like that was refreshing, especially against the trend towards dark or morally ambiguous characters in SFF. You need the text of this book. I love audiobooks. I loved this audiobook — Kyle McCarley infuses a challenging text with emotion and color. But listening to this book without a reference is like trying to read Tolstoy without knowing how Russian names are constructed. There are hundreds of characters, some only mentioned once, all with complex names with non-intuitive spellings. Plus everyone has a title, which of course is an Elvish word rather than “lord” or “lady.” Plus there are a lot of five-syllable words used for unique cultural concepts. Without the text, I got as far as the scene where a mess o’ Drazhada (the ruling family, to which Maia belongs) swear fealty to him at his coronation — and was so confused I promptly went out and purchased the ebook, and spent the next hour poring over the glossary. Once I had the text in hand, I could listen to the audio without endlessly referring to it, but it was helpful for knowing how things were spelled and who was related to whom. The characters. Maia is fascinating as a character. The most common descriptor I hear of him is “adorable,” and it’s true. I kind of want to smoosh his cheeks. As the hated child of the hated fourth wife of the former emperor, he has a history full of neglect and abuse, and we just desperately want him to be happy. Some of the sweetest moments are the highs and lows he feels — saying “I love thee still” at his mother’s tomb, or expressing amazement that anybody would acknowledge his birthday. Maia is the only viewpoint character, so there’s a lot to love there, but he’s not the only character to pay attention to. Csevet, Cala and Beshelar, Thara Celehar, Csethiro, Vedero… they’re all fabulous characters, painted deeply with only a few brush-strokes. I think equally fondly of Csevet’s impatient throat-clearing, the deliberateness with which Celehar treats the dead, and Csethiro’s comments about dueling. I also liked seeing that being an emperor is a lot of emotional labor, some aspects of which Maia excels at, and some of which he is rubbish at. The amount of importance put on small talk — and the direness of Maia’s social awkwardness — paints a picture of a world where being a good ruler involves more than just making policy decisions. This idea of leadership as involving relationship maintenance feels rare in fantasy. Even the decision to talk about the clothes Maia wears feels important in this light — it’s not excessive description, and it’s clear these are not trivial choices. (It matters that Maia’s jacket has tiny pearl buttons if what you’re trying to show is how he’s so anxious he can’t button them, in other words). The world-building. This is a rich, steampunk-y world, where airships and factories and gaslights and pneumatic post are all things that exist. The main characters may be elves and goblins, but this is no stereotypical fantasy world where the elves are all beautiful and enigmatic and the goblins are ugly and barbaric. Sure, the elves might think that, but it goes both ways (Maia describes your typical elf as “ferret-faced”). Instead of outright war between the two factions, we have complex political negotiations, diasporas, and intersections of race and class. There’s also a complex east vs. west dynamic to the Elflands, and a muddled, neverending war with a people called the Evressai to the north. There are gods with fuzzy spheres of influence. There is magic — but a very roughly-defined sort of magic, which works only because it’s never called on to do much of real importance. Both elves and goblins have a subtle body language based on ear positions which I never quite worked out. In brief, it’s the kind of world that requires a glossary — and I’m okay with that, because those are the sorts of books that taught me to love fantasy. And the language! Well — that deserves its own bullet point. The language. Okay, I’m a language geek, so of course I’d say this. I suspect Monette is, too, considering the dinner conversation which becomes a discussion of philology. “We” also gets used as a formal first-person, rather like the “royal we” (except it’s used to the emperor as well as by the emperor). Sometimes this necessitates tagging dialog as “using the plural, not the formal,” but it’s generally well-handled. This enables Monette to do some very clever storytelling with in/formality — like when Maia stops addressing Setheris, his abusive former guardian, as “thee,” as a way of making their new relationship clear. Or when he drops formality to tell his bodyguards how much they mean to him. Secondly, we get glimpses of an Elvish language that extends beyond the page. We see recurring morphemes (“death,” “magic,” etc), word endings that indicate part of speech and gender (-is/-o), and words that have become archaic (“morhath,” brought up in the philology discussion). Finally, there are just some beautiful turns of phrase. Arbelan Drazharan describing the previous emperor as “a killing frost” still sticks in my mind. Overall, the wordplay is impressive, but also a little intimidating, and I can see how some readers might not like it. But for me, it worked really, really well. An escape from toxic masculinity. Maybe this is strange to talk about, but it’s something I don’t see enough of in SFF — we can imagine anything, and yet we often still imagine men who aren’t allowed to cry. Maia is delightfully free of all this. As emperor, he isn’t allowed to give vent to his emotions; but from inside his head, we see he is plagued with grief and self-doubt. We are allowed to feel it along with him — along with his frustration at being unable to deal with it through his usual coping mechanism of meditation. On this note, I really like how the plot with Min Vechin was resolved — he’s clearly attracted to her, but turns her down when she propositions him, mostly because he’s a virgin and terrified of the prospect of bedding her. It’s rare (and vulnerable) that a male character is portrayed as having those kinds of fears. This is handled well, although I would have liked some of the major characters to have been included in this diversity. Resonance and theme. I love the recurring bridge-building imagery, and Maia’s evident joy at both the mechanics and the politics of it. 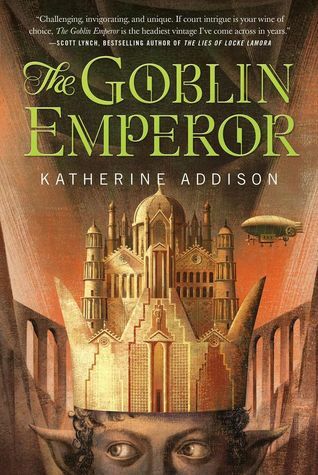 Near the end, the decision to describe the person responsible for the airship crash that brought Maia to power as looking almost exactly like him — half-goblin, with blue eyes, black curly hair, and slate-grey skin — is just perfect. The cover art. Not Monette’s doing, but look at that cover art. Maia, with the weight of the entire Elflands on his head. Look at his shifty and suspicious eyes. Look at the bridge! Look at the airship! It’s symbolic and beautiful. Really, this book is amazing, but there are a few things that would have made it even better. For all that there is this deep and diverse world-building, gender roles are still pretty staid — Maia inherits, after all, thanks to our old friend agnatic primogeniture succession, which disallows women from inheriting noble titles. Like in many traditional feudal societies, women of noble birth are valued primarily for their ability to forge marriage alliances and make babies. Going to university is seen as “devaluing” women for this purpose. It’s also unlikely in this setting for women to serve in military roles (like the emperor’s bodyguard). While I very much love the language aspect of the world-building, I feel like it could be an obstacle for some readers. In many instances I feel it could have been used more selectively for maximum impact. There’s nothing untranslatable about common terms from monarchy like “gentlemen of the bedchamber” or “privy council” or “bodyguards” that needs to get special Elvish words like edocharei, Corazhas, and nohecharai. Overall, I gave this book five stars on Goodreads, and added it to my favorites list. It was a rare book where the sadness that it was over eclipsed the feeling of accomplishment at having finished it. (To somewhat allay that sadness, I went and read fanfic. I highly recommend “Give My Hands True Purpose” if you want more about Maia and Csethiro). Have you read this delightful book yet? What did you think of it? Will it be getting your Hugo vote?